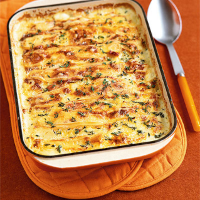 Combine smoked bacon and French mountain cheese to make this warming Alpine-style dish. Preheat the oven to 180°C, gas mark 4, and lightly grease a 1.5-litre ovenproof dish. Heat the oil in a frying pan and fry the bacon and onion over a medium heat for 4-5 minutes until beginning to brown. Chop the thyme, reserving a few leaves for garnish. Place the thyme, cream, milk and garlic in a large pan. Bring to a simmer, then add the potatoes, cover and cook for 5 minutes. Stir in the bacon and onions and season with a little freshly ground black pepper. Place half the potato mixture in the bottom of the dish, then place half the sliced cheese over the potatoes. Repeat, finishing with a layer of cheese. Bake in the oven for 40-45 minutes, until the potatoes are tender when pierced with a knife and the top is golden brown. Garnish with the remaining thyme, and serve with Waitrose Tenderleaf Salad and some chunks of Grand Mange Blanc bread. This dish can be assembled ready to cook several hours in advance or the day before. Cool, then cover with clingfilm and leave in the fridge until required. Allow 10-15 minutes extra time in the oven if cooking straight from the fridge, then continue from step 3. Peel the potatoes if you prefer. The Reblochon could be replaced with Brie or Chaumes. Cut through some of the richness of this dish with the robust Parallèle '45' Côtes du Rhône, Paul Jaboulet Aîné, from France.